Our booth will feature new plants from UpShoot and Concept Plants and we’ll have a new story ideas flyer which provides content on nativars, fine foliage finds, flower power, staples in the garden and more. We’ll also showcase pots from daVinci which are #madeintheusa, and a cool line of edutainment products to engage the budding gardener from Evergreen Creations including Spookley the Square Pumpkin. I’m also pleased to announce our special guest, Kathy McKay of Schoneveld Breeding. Kathy is one of the most knowledgeable perennial, bulb and pot plant experts in the green industry. She represents the leading breeder of cyclamen and will be there with plant samples and care tips for these and other plants they’ve introduced. Kathy is one of my go-to plant resources and I’m glad to introduce you to her; she is invaluable! 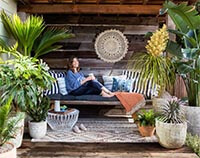 Last but certainly not least, be sure to catch Kelly Norris and I on Thursday, August 16 at 11 a.m. as we present “Introductions to New Plants,” a showcase of the latest and greatest new and/or underutilized plants on the market. Be sure to visit these UpShoot clients who will also be exhibiting in Chicago! J. Berry – They just won the Reader’s and Editor’s Choice Medal of Excellence Awards at #Cultivate18 from Greenhouse Grower magazine for their Summer Spice™ Hardy Hibiscus. Rozanne® and Friends – We’re delighted to be working with Christine Kellerher and Aris Hort, specifically on their Must Have Perennials division. MHP is the trade side of their business and Rozanne® and Friends is how they connect with consumers. Corona Tools is always a must stop at GWA and we’re tickled to now produce their monthly eblast full of good gardening content, tool features and discounts. If you’re not on their mailing list, Chris will be happy to sign you up! 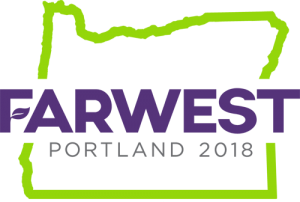 UpShoot will be at the Farwest Show in Portland, Oregon from August 22 – 24 in booth 3057. Additionally, our new Virginian Arborvitae will be part of the New Varieties Showcase. Maria is scheduled to deliver an educational session “Get New, Stand Out” on Thursday, August 23 at 9:45 a.m. and then she’ll be the lead in the “Walk the Show Floor with Experts” later that same day at 1 p.m. FYI, there is a GWA Connect meet at Farwest. Registration is open through August 21. 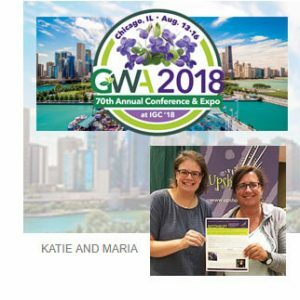 Visit UpShoot in “The Land!” Maria, along with GWA Region III Director Susan Martin have put together a great regional meeting in September. The “Cleveland Grows! Tour” is happening September 21 and 22 and will give you access to some of the premiere green industry businesses and private gardens in the country including Willoway Nurseries, Petitti Garden Center, Just Add Ice Orchids at Green Circle Growers and private gardens by Bobbie Schwartz and Nancy and Cliff Drobnick. The highlight will be a round table including editors from all the major green industry trade journals which are all based in Northeast Ohio including Ball Publishing (Green Profit/Grower Talks), GIE Media (Garden Center, Greenhouse and Nursery Management and more) and Meister Media (Greenhouse Grower). Discount hotel rates are available so don’t delay, sign up today and come to Ohio, The Heart of It All! We’re doing a new tree happy dance as Martha Stewart features 44 Marleys Pink™ Weeping Styraxfrom John Lewis of JLPN in Salem, Oregon in an allee on her farm and details them on her blog! LCN Selections Créme de Mint™ and Cherry Vodka™ dogwoods, produced as a top-graft, were featured on Garden Time TV thanks to Ken McVicker of Van Essen Nursery in Lebanon, Oregon. The Flora Grubb talked about her home garden in Sunset Magazine which includes our Old Fashioned Cotinus! Also Old Fashioned is a favorite of the #finefoliage ladies, Karen Chapman and Christina Salwitz. Brienne Gluvna Arthur and I co-hosted a GWA Connect Meeting at Gardenia Days held by Oakmont Nursery in Silar City, North Carolina. Owner and breeder Phil Dark treated guests to the sites and smells of his gardenias including Crown Jewel and his latest introduction, Prince Charles™. He also presented everyone with a gardenia care tip sheet you can download here. Crown Jewel is available nationwide and Prince Charles™ is available in limited quantities. New flyers are available on some of our new plant introductions – you’ll find them here. High resolution photos of our new plants are available upon request. If you’ve previously received plants or product from UpShoot at a regional or national meeting or a trial kit mailed direct to you, AND if you’ve featured any items in your work (be it a blog post, article, etc….whether it was recently or a bit ago) please be sure to share a link or hard copy with us so we can cross-promote!